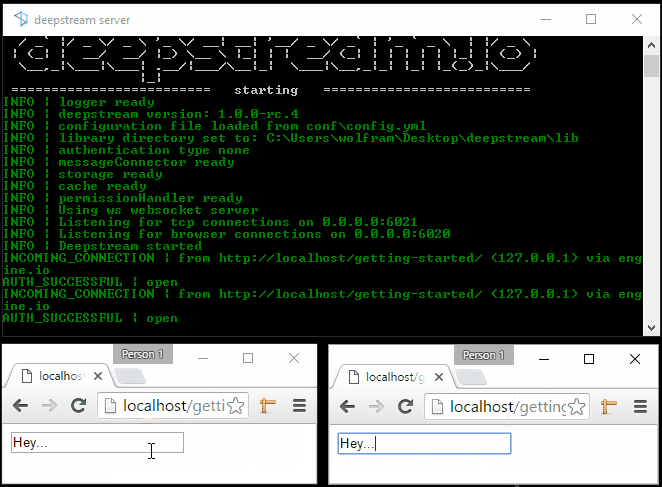 German start-up deepstreamHub has launched deepstream.io, an open source, scalable, real-time server platform. The platform is designed for applications that require a network of device-resident nodes that communicate with cloud applications or with one another. Individual nodes can subscribe to topics and receive data whenever other clients publish to those topics. Nodes can also register functions that can be called by other nodes. The deepstreamHub platform is also available as a resource for additional services. a rich and open ecosystem of third party integrations that allow users to stream data from and to messengers like Slack, developer platforms such as GitHub, social networks, IoT endpoints, payment providers and open data sets. The user then opens the index.html page in two separate browser windows (as depicted in the image above), and types some characters into the text field in one of the browser windows. The changed status of the text field is immediately communicated by the deepstream.io client to the installed deepstream.io server, which communicates the changes to the second browser via its deepstream.io client. As the animated GIF image at the top of the Getting Started page shows, the changes are communicated immediately, on a character-by-character basis. The deepstream API Documentation is thorough. The Info page includes information about the deepstream.io community, performance testing, message protocol, and client behavior specifications.